Mr Hunt, the first Western foreign minister to visit Iran since the US pulled out of a nuclear deal and imposed sanctions on Tehran, also called for its leaders to cease "destabilising activity". Mr Hunt, who is due to arrive in Iran on Monday, said: "More than anything, we must see those innocent British-Iranian dual nationals imprisoned in Iran returned to their families in Britain. "I have just heard too many heartbreaking stories from families who have been forced to endure a terrible separation. "So I arrive in Iran with a clear message for the country's leaders: putting innocent people in prison cannot and must not be used as a tool of diplomatic leverage." 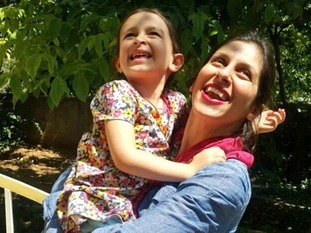 Mrs Zaghari-Ratcliffe, a British-Iranian mother who works for the Thomson Reuters Foundation, was arrested at Tehran's Imam Khomeini airport in April 2016 and later sentenced to five years in jail after being accused of spying, a charge she vehemently denies. Mr Hunt pressed Mr Zarif on her case in September when they met in New York on the fringes of a United Nations General Assembly. Britain and its European allies responded with dismay to US president Donald Trump's decision in May to pull out of the 2015 Joint Comprehensive Plan of Action (JCPOA) that relieved sanctions on Tehran in return for an end to Iran's military nuclear ambitions. Mr Trump said the Iranian regime was not doing enough to halt its nuclear programme or its support for terrorism and groups fighting in Syria. On Monday, the rebels said they are halting drone and missile strikes after a request from the United Nations. Mr Hunt said: "The Iran nuclear deal remains a vital component of stability in the Middle East by eliminating the threat of a nuclearised Iran. "It needs 100% compliance though to survive. "We will stick to our side of the bargain as long as Iran does. "But we also need to see an end to destabilising activity by Iran in the rest of the region if we are going to tackle the root causes of the challenges the region faces."